If you’re working as a customer service representative and interacting with a lot of native speakers on the phone or in person, you’re probably really concerned about clear communication in English. When working in a customer service or other client-focused position, you need to be really concerned about whether the person you’re speaking with understands you, and whether they trust you. As we discussed in How to Handle Comments About Your Accent, studies have shown that we’re more likely to trust someone who has a slight accent, but we’re less likely to trust someone who has a stronger accent. While it may be challenging or unnecessary to completely eliminate your accent, there are some things you can do to improve your communication in English. First, I encourage you to improve the clarity of your speech by focusing on word and sentence stress, and improving your English rhythm and melody. Even if you have an accent, correctly stressing words will help people understand you more easily. As I often mention, we’re listening for stressed syllables in stressed words in order to identify which word you’re saying. By drawing the other person’s attention to the words that truly matter in your speech through stress, you’re helping them understand you. On top of that, I often say that you can hide pronunciation mistakes behind a stressed syllable, which is great if you have trouble pronouncing certain consonant sounds. To get started, check out my article and video on Word Stress in American English, then make a list of words you use all the time in your work. If you’re using these words frequently, you want to make sure that you’re stressing them correctly. Next, you want to look up the correct stress for each of these words. You may find that you haven’t been stressing the words at all, or you’ve been stressing them on the wrong syllable. If this is the case, you’re going to need to do some work to unlearn the bad habit, the incorrect stress, and relearn the correct way to say the particular word. This is especially important when you use these words all the time, because these are the words you want to make sure you say correctly for authority when speaking. For example, consider the words “customer,” “representative,” “technical,” “assistance.” You want to make sure you’re stressing these words on the correct syllable. Make sure that the stressed syllable is longer, louder, and higher in pitch. As you focus more attention on word stress, try to keep it simple: Start with the words that are most important to say correctly when interacting with customers or clients. With more practice, you’ll start applying this to other words you use all the time. You may also want to think of word pairs, phrases, and short questions and answers that you use all the time. For example: customer service, customer service representative, call center, technical assistance. Listen to how your native-speaking colleagues use these phrases. Notice which syllable receives the most stress in the entire phrase. Then start using these patterns in your own speech. This is how people are expecting you to say these phrases, and it makes it easier for them to follow what you’re saying. Let’s see how stress can change the clarity of this statement: I’m happy to help you with this. With a more monotone voice without much stress, it may sound more flat and hard to understand. As you can hear in the video, it’s not as easy to understand what I’m saying. Let’s try it with clearer stress: I’m HAP-py to HELP you with THIS. Stressing the most important words in this sentence helps communicate which words are truly important, and what the person has to listen to. When you correctly stress the important words, the other person feels like they can understand you better. Most importantly, that will help them feel more confident that you’re going to be able to help them. Next, as you continue to improve your speaking skills, think about how you can change up your speech to be more interesting and engaging. Remember that you can vary your volume, pitch, pace, or speaking speed in order to emphasize key ideas. You can pause for emphasis, or break your ideas into logical chunks, also called thought groups. If your volume, pitch, pace, rhythm, and melody are completely even all of the time, or you don’t pause for emphasis, or even just to take a breath, your speech can sound monotonous to a native English speaker. We tend to use more variety in our speech, and we’re expecting to hear it when interacting with someone else who’s speaking English. This means that it may be harder for us to follow what you’re saying if you’re not breaking up the rhythm, breaking up the melody, changing up your volume, your pace, your pitch. Remember, in English the responsibility is on the speaker to clearly communicate the meaning to the listener. For more ideas on this topic check out my video on how to use your voice and breath to sound more professional when speaking English. Third, you might want to consider slowing down, especially when talking about key points. Like I said a moment ago, we change our pace in order to signal that certain points are more or less important. Beyond that, there are many reasons that you may speak quickly. If you’re fluent, you may be naturally speeding up because you feel more confident when speaking English, or you want to prove how while you speak the language. On the other hand, if you’re nervous you may speed up to get through your ideas more quickly, or to hide the fact that you really don’t speak as well as you’d like to. Slowing down will enable you to fully pronounce your words. Most importantly, slowing down gives you time to correctly stress the right syllable. If you can only focus on one aspect of your accent because you have limited time and energy to focus on how you sound, pay attention to stress. Correctly stressed words are more important than perfectly pronounced words! Check out my video on why you should slow down to reduce your accent for more reasons why this matters. Fourth, pay attention to your intonation. Remember that you signal that you’re done speaking with falling intonation, while you keep the other person listening with rising or holding intonation. If your voice ends high after a statement, a native speaker will be waiting to hear what comes next. Especially on the phone or in a more professional interaction, they’re probably going to be more likely to wait their turn before speaking up. Remember our example from before: I’m happy to help you with this. Your pitch should fall from the most important word in this sentence, which is the word “help”: I’m happy to HELP you with this. When you’re asking a question, you also need to consider your intonation. If you’re asking for information, you want to use falling intonation in order to signal that you’re ready for their answer. Consider this common customer service question: How can I help you today? As you can hear, my voice is rising to the most important word, “help,” and then falling down afterwards: How can I HELP you today? If you’re asking them for a simple yes or no answer that doesn’t require a lengthy response, then you want to use rising intonation. For example, your voice will rise from the word “help” in this question: Is there anything else I can HELP you with? For more examples that compare these two intonation patterns, be sure to check out my video on choosing falling or rising intonation. You can also watch my other videos on intonation in questions. When handling challenging situations or difficult problems, we often change our intonation in order to reflect the seriousness of the situation, to show more patience, to sound more polite, or to show sympathy and compassion. Check out my resources on how to sound more polite in English for more examples. My last tip is to pay attention to active listening strategies. You want to be sure that you reflect back that you understand the person in a number of verbal and non-verbal ways. Obviously on the phone you’re going to need to reflect back that you understand in more verbal ways. In English, we expect people to confirm that they follow what we’re saying. If you’re on the phone, you want to indicate that you’re listening, that you understand what they’re saying, that you follow their ideas, and so on. You can use simple sounds like “Mmm,” “Mmm-hmm,” “Hmm,” “Oh,” “Yeah,” “Okay,” “Right,” in order to show that you’re listening. In addition, if you need clarification, ask for it. This helps people feel more confident that you’re getting all the information that you need. If you think that they need clarification, you may want to give it to them before they ask. After all, anticipating someone’s needs is key to good service. Check out my video on five ways to show active listening for more details and suggestions. While your ultimate goal may be to sound like a native English speaker, you have to start somewhere. These tips will get you moving in the right direction. Now that you’ve heard my suggestions, do you have any others you’d like to share? What’s worked for you? 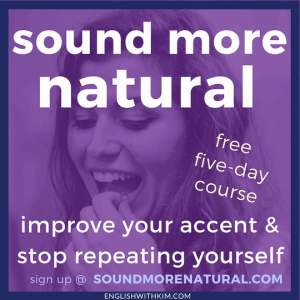 If you want to get started speaking English more clearly, sign up for the free course, Sound More Natural in English. This five-day email course will help you create an accent reduction practice and improve the clarity and impact of your speech.